At any given moment in time, there is a place in the world where a leaf is falling gracefully to the ground. 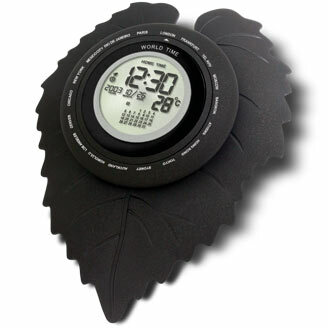 Bedol's Leaf World Time Clock offers a rotating bezel allowing you to keep track of 18 various time zones and is beautiful addition to any environment, both as an artistic piece or functional tool. The multifunction LCD display proudly features time, date, year, temperature (F or C), and humidity, all brilliantly backlit and illuminated at the slightest touch. Available in black or silver, and whether on the wall or standing alone, Bedol's Leaf World Clock is sure to serve as a conversation piece and as a testament of what's next in functional modern design. You have no match found for also purchased products.